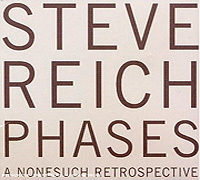 Phases is the five CD retrospective released to coincide with Steve Reich's 70th birthday. It is a fascinating look at an artist whose influential work spans the simplicity of playing two tape loops into non-synchronization (Come Out), to the sophistication and elaborate arrangements of music performed by large ensembles (Tehillim). The title Phases refers to the several musical junctures that directed Reich's path, as well as the effect of two rhythmic lines slipping in and out of time with one another - the later an integral concept in Reich's work. More accepting of melody and harmony, western musical thought downgrades the concept of polyrhythmic complexity, but nonetheless it is profoundly present in Reich's music. Often referred to as a Minimalist, Reich started out as a percussionist and has built his awesome catalogue of work upon this relationship with music. In compositions like "Music for Mallet Instruments, Voices and Organ" and his masterpiece "Music for 18 Musicians" almost everything turns into a percussion device. Voices, cellos and clarinets push rows of notes aligned in mechanistic precision with the harder sounds of xylophones, marimbas and glockenspiels - all running the minute variations inherent in this genre's cyclical patterning. Here there are no melodies, but for those perceived in the dancing and pulsing rhythms. Incredibly, these pieces do not suffer from the cold methodology of high-concept art. Reich's work feels more celebratory, even tender and warm in some parts. His long-form compositions really benefited from the advent of the compact disc as the original LP releases needed to be turned over mid-way. Once available on CD, the music could be absorbed as Reich intended - straight through, with whatever transformative powers these works possessed fully felt from the prolonged exposure. Recent works reveal more truths about Reich's compositional process by providing an object lesson harkening back to his early work with snippets of speech and tape loops. Reich based the fundamental rhythms and patterns of his monumental works on the simple melodic content of stray talk. Isolating the melodies present but often unnoticed in everyday chat, Reich transposed these found melodies into instrumental rhythms. This process is illustrated in scores such as "New York Counterpoint" and "Different Trains" which prominently feature voice loops played back in the rhythmic synch and tonality of the instrumental lines performed by the ensemble. Reich's work is part of the 20th century. By building on such diverse elements as African drumming, Balinesian Gamelan, technology, his own Jewish heritage and life in America, Reich's stimulating works have always asked us to reconsider the way we listen to music, and rewards those who do.